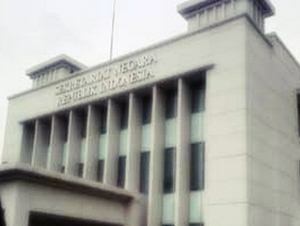 Kementerian Sekretariat Negara Republik Indonesia - SETNEG is the Ministry of State Secretariat of Republic of Indonesia. Setneg is the Indonesian ministry with main tasks to provides technical and administrative support to the president and vice president in the organizing power of the state. SETNEG is based in Jakarta and its principal office is registered at in Jl Veteran 17 - 18 Jakarta. Accodting to SETNEG The organizational structure of SETNEG comprise of Secretariat of the President, Secretariat of the Vice President, Military Secretariat of the President, Secretariat of the Ministry, Deputy Minister for Policy Support, Deputy Minister for Human Resources, Deputy Minister for Relations with Institutions and Community Organizations, Deputy Minister for Legislation Affairs, Expert Staff, Inspectorate, and Centre for Education and Training. Since 2014, the Secretary of State (Mensesneg) held by Pratikno. Internship Period : 21 November 2016 - 21 Februari 2017. JobsCDC.com now available on android device. Download now on Google Play here. Please be aware of recruitment fraud. The entire stage of this selection process is free of charge. 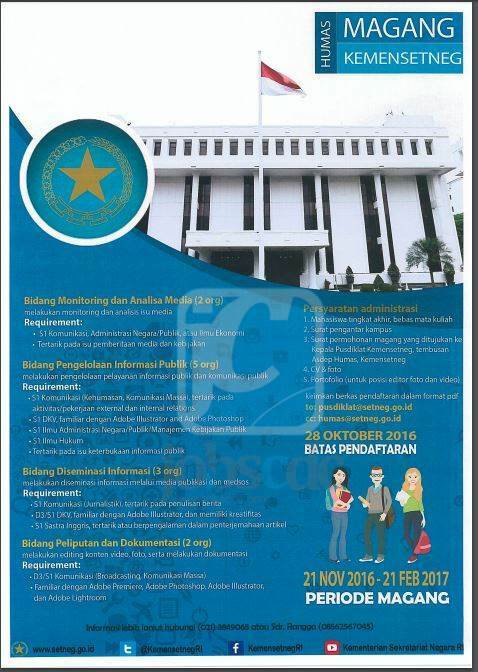 The Ministry of State Secretariat of Republic of Indonesia - D3, S1 Internship Program SETNEG October 2016 will never ask for fees or upfront payments for any purposes during the recruitment process such as transportation and accommodation.